Free Shipping Included! Avalon Premium Hot/Cold Top Loading Countertop Water Cooler Dispenser With Child Safety Lock. UL/Energy Star Approved- Black by Avalon at Defy Now. MPN: A1CTWTRCLRBLK. Hurry! Limited time offer. Offer valid only while supplies last. The Avalon Countertop Hot/Cold Water Cooler is made with innovation and style. The easy-to-use paddle spouts make it so much more convenient to use. The Avalon Countertop Hot/Cold Water Cooler is made with innovation and style. The easy-to-use paddle spouts make it so much more convenient to use. Simply press your cup against the paddle to let the flow of water to come out. The machines highly efficient compressor makes the cold water crisp and ice cold at approximately 47° F without the need of adding ice cubes to your drink. The hot faucet is hot enough to cook one's tea or coffee or any other steaming hot beverage at approximately 180° F. Due to the extremely hot water, we’ve added a child safety lock on the hot water faucet. 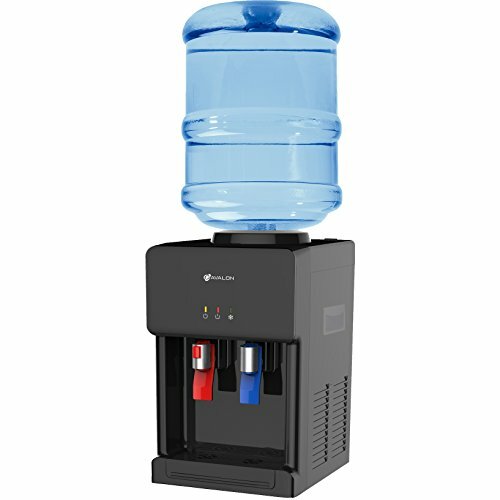 This water cooler is suitable for both 3 and 5 gallon bottles. The water dispensing area measures 9.5x2.5x10 inches with a height of 7 inches below the spouts to accommodate most large cups and bottles. At the bottom of the dispensing are there is a large removable drip tray to catch and spills. The water cooler is UL listed and complies with all standards of Energy Star. The unit dimensions are 12x12x19 inches.